Please follow the instructions carefully in order to maximize its optimal effect. For any questions, please visit Q&A link for further assistance. Usage instructions are also provided in our Online Store. Add SUPER ZOIL via the engine oil inlet. The appropriate amount is 8-10% of total engine oil. Make sure not to over fill by adding SUPER ZOIL. SUPER ZOIL is most effective when added just after an oil change. SUPER ZOIL can also be used for gasoline engines (including rotary engines and horizontally-opposed engines) and for diesel engines. Breaking-in period is NOT necessary when using SUPER ZOIL. The treatment with SUPER ZOIL is completed after only several minutes of driving. ・If the oil is badly contaminated, replace the oil and oil filter. 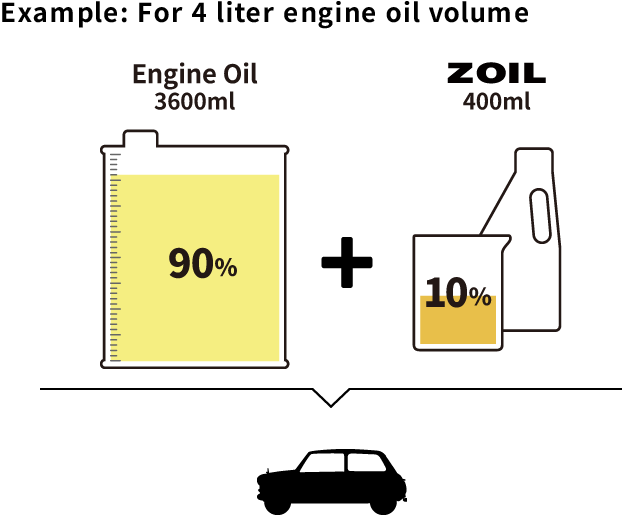 When carrying out oil and filter replacement, we recommend additional application of SUPER ZOIL amounting to 3% of total engine oil to obtain its best effects. ・SUPER ZOIL extends the service life of the engine, however it does not guarantee trouble-free engine performance. Add SUPER ZOIL ECO via the engine oil inlet. The appropriate amount is 5% of total engine oil. SUPER ZOIL ECO is most effective when added just after an oil change. SUPER ZOIL ECO can also be used for gasoline engines (including rotary engines and horizontally-opposed engines) and for diesel engines. Breaking-in period is NOT necessary when using SUPER ZOIL. The treatment with SUPER ZOIL ECO is completed after only several minutes of driving. ・SUPER ZOIL ECO extends the service life of the engine, however it does not guarantee trouble-free engine performance. 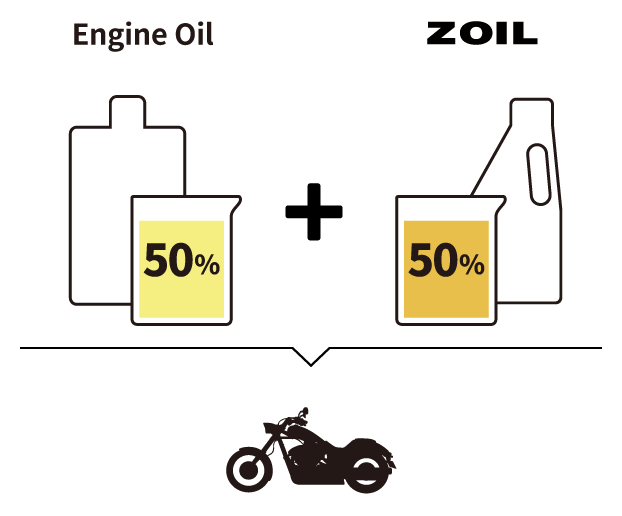 Mix SUPER ZOIL for 2 Cycle with engine oil at the rate of 1 to 1. After the first use, SUPER ZOIL can be diluted to 5 to 1. Use SUPER ZOIL for 2 Cycle as it is or mix with engine oil at the ratio of approximately 1 to 1. For racing motorbikes, we recommend the usage of SUPER ZOIL for every run. ・Please make sure not to over-rev. after applying SUPER ZOIL. SUPER ZOIL makes the engine to revolve smoother than before. ・Use of SUPER ZOIL, depending on the type of machine, as it may result in excessive exhaustion of smoke, or a small amount of accretion could cover the plug. If this happens, dilute SUPER ZOIL by reducing it s proportion in the oil. ・Use of SUPER ZOIL for 2 Cycle can help prevent the engine from seizing up, however, it does not guarantee that the problems mentioned above will not occur. Therefore, choose the level of dilution at your own responsibility. *Please reduce the amount of SUPER ZOIL for 2 Cycle when heavy white smoke is emitted or when plug is black after usage. *SUPER ZOIL for 2 Cycle can be used for Radio Controlled Cars, however it CAN NOT be used for alcohol fuel and nitro fuel. When SUPER ZOIL is used for manual transmissions and differential gears, add it at a ratio of 5-8% of total transmission oil and differential gear oil. ・Use of SUPER ZOIL for manual transmissions should be limited to cars in which the transmission oil is regularly changed. ・In some cases, it is better not to change the transmission oil itself, if it has not been changed after more than 40,000 km. ・Satisfactory results have been reported with the use of SUPER ZOIL after more than 40,000 km, however, we are not held responsible for any problems that might occur. To avoid the misunderstanding of the trouble, we do not recommend the use for ATF machines. PLEASE NOTE the above when applying for ATF machines.